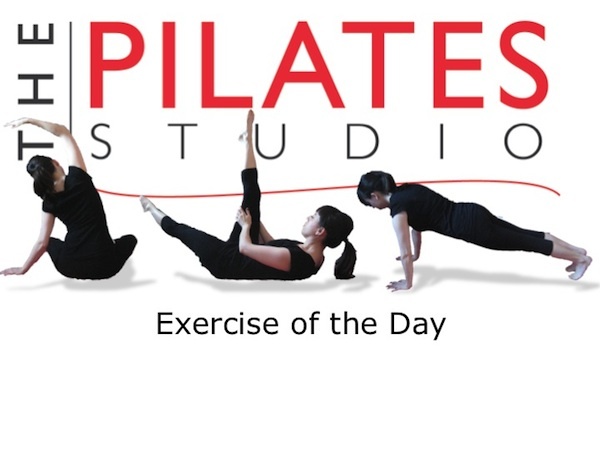 This exercise is intended to increase the range of motion of the thoracic spine, and to strengthen the relationship between abdominal strength and arm movement. To do this exercise you will need a mat. Start by lying on your back with your knees bent and your feet planted into the ground. Clasp your hands behind your head and inhale into the back of your ribcage. Exhale as you press your ribcage into the ground and lift your head, neck, and shoulders into the air. Inhale into the back of your ribs as you release your hands and arc them through the air toward your thighs. Exhale as you clasp the back of your thighs to increase the spinal flexion and lift your head, neck, and shoulders higher. Inhale as you reverse the arm arc and return your hands behind your head, while maintaining the increased spinal flexion and then exhale as you release your head, neck, and shoulders to the ground. Repeat 8-10 times. This exercise requires additional abdominal control when moving the arms. Often people complain of pain in the back at the base of the ribcage when lifting the arms over head. The loss of abdominal control in overhead movement can cause us to arch our back. With this exercise you have a great opportunity to practice the differentiation of arm movement to spine movement, which creates a strong center for any arm movement required. The breath pattern of this exercise is very important in that if facilitates the core control necessary for the increased flexion and arm movement.